Ensure that your restroom toilets stay clean with this Impact 333 scratchless toilet brush with a caddy! This brush's all-plastic construction resists scratching while providing a thorough clean. Compared to conventional wire brushes, the white plastic handle and brush are easier on your surfaces and cleans the hard-to-reach places in a toilet bowl. Well, it cleans the toilets and does not scratch them. It is certainly scratchless. The toilet bowl brush caddy is a nice addition. We were worried about how this would look sitting in the bathroom, but it just blends in and no one seems to notice or care. One of the best toilet brushes out there. This brush is comparable to some of the higher dollar brands out there but at a much lower price. Great quality and made to hold up even with heavy usage. The caddy is a handy stand if you're leaving the brush in one area. Not a bad brush for the money. It can clean all corners of the bowl. I was afraid that the bristles would be too soft since this is "scratchless" (has anyone ever had a toilet brush scratch their toilet?) but they work fine. Has never given us any problems. We purchased a couple months ago and there is no bristle break off. It is sturdy and scratchless. Love it. I purchased several of these toilet brushes for my bathrooms at my coffee shop. They are a great price. They are not flimsy which was a concern I had. So, great price and well made. You can't go wrong with this toilet brush. These are typical as expected toilet brushes. The serve the purpose intended and for the price cannot be beat. The pricing allows them to be discarded without having to use them for a long period of time. Will continue to them. I was not expecting this toilet bowl brush to be any different than what I’ve purchased in the past from a retail store – I was just drawn to the price! However, I was surprised at how much better it reached those hard to clean places and the caddy keeps the bristles cleaner longer since water is collected into the bottom and mold is less likely to form around the bristles. If you keep the caddy clean with bleach every so often, you’ll really prolong the life. This toilet brush does its job well. The caddy is essential because you don't want to drip toilet water. I have noticed the bristles stain easily though and I'll probably replace it sooner than I'd have liked. The Impact 333 scratchless toilet bowl brush is a great value! It comes with the caddy, which allows the water and cleaner to drain, doesn't scratch, and cleans pretty well. Great price! THIS is a basic toilet bowl brush that also comes with a caddy for a very affordable price. Will use it often and then replace as needed . These are inexpensive and do the trick just fine. We purchased them for our gym and coffee shop. We have five bathrooms between both places, and these are unbelievably sturdy for the price. Well made product for the price compared to many of the other retailers. Worth adding to my order compared to buying at a local store. This is such a handy and useful tool to clean your toilets and store it in an orderly fashion. Cost effective and does the job well. This is a terrific toilet bowl brush. The caddy holds the brush nicely and allows it to dry preventing mold and mildew from growing on it. The brush part is quite stiff, which actually is what I like. Before this one, I used to use a bit softer brush and the brush held water easily. This scratchless toilet bowl brush with caddy is really great. THe stick is long enough to get to the depth of the toilet its bristles are strong enough to clean, but do not scratch. No one likes to do it, but it has to be done. Cleaning toilets is never that fun but having the right tools for the job is important. This toilet bowl cleaner features a long handle to keep hands away from any splashes. The plastic brush is also easier on the toilet bowl and will not scratch it. We do suggest wearing gloves when cleaning the bathroom. This set includes the caddy to store the brush in when not in use. The Impact Scratchless Toilet Bowl Brush with Caddy is an excellent bargain. It's a great brush with tough bristles, and a firm nicely sized handle. 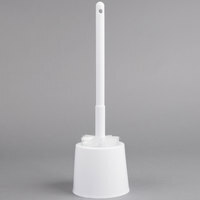 This economical toilet bowl brush and caddy set is perfect for any office, restaurant of home use. Nylon bristles won't scratch your toilet bowl yet are stiff enough to clean your toilet. Excellent brush. Much better than other toilet bowl brushes. Handle and bristles are very, very stiff and rigid: they do not bend much under pressure. Great value. Easily recommended. You can get it here and enjoy the convenience of having it shipped to you. Or, you can get it from the dollar store on your way into work. Either way, they are (or seem to be) one and the same product. I didn’t expect Webtaurant to carry such versatile cleaning equipment, but they do! I happened across this toilet bowl cleaner and had to pick one up because it’s so much cheaper than getting one at the local store. I replace mine often just to prevent mold growth. This toilet brush with caddy works great! The brush and bristles are strong, not flimsy; I was able to really scrub the toilet this is a great purchase for the price. Impact 333 scratchless toilet bowl brush with caddy! A item for your restroom with storage. Very reasonable priced and again delivered right to your door! This is a great little toilet brush, it's really good quality and the price is unbeatable. I mean there's not much more to say about a toilet brush! Previously I only had one brush for the whole house. At this price, why not have one for each bathroom? The brush and caddy do a fine job and seem to be good enough quality for the price. Good quality for an inexpensive price. This is a hefty brush that won't scratch up your toilet bowl. Comes with a handy caddy for storage. This impact Scratchless Toilet Bowl Brush with Caddy is exactly as described on the website. There are not any extra bells and whistles so cleaning is a breeze. The brush fits well in both the caddy and in a standard toilet, which so far has not shown any scratches. I would recommend. The Impact 333 Scratchless Toilet Bowl Brush with Caddy is the best toilet bowl brush I have ever used. It does a great job without too much scrubbing. The quality definitely exceeded my expectations. Highly recommend! Nice little set. Nothing special, but at this price I didn't expect a miracle! Works fine and much cheaper than buying from a regular store. This bowl brush and caddy set is a perfect item for any restroom at your business or home. The nylon bristles are stiff but won't scratch your toilet bowl. This product is awesome! This scratchless toilet bowl brush gets the job done! Scrubs well and the scrubbing part is fairly large for easier scrubbing. Perfect price and pretty durable, totally pleased customer here. I have purchase toilet brushes before that were more expensive and did the same job, would recommend. This is definetly professional quality. It is very strong so you do not have to worry about it breaking if you use it to get out tough stains. I have bought many cheap toilet bowel cleaners and they always break. I came across this one on the website. This product is so much more sturdy then other items I have used. The bristles are stiff enough to do a great job cleaning; they don't scratch the bowel. Similar price to similar products, but much more sturdy and durable. We're very happy with this toilet bowl cleaner it's at a great price and works fantastic we will definitely be buying more for our other bathroom . It is a great price. What can you complain about it? And it's really good quality by the way. It fits my need and below the budget. This is a simple Toilet bowl brush, doesn't scratch the bowl as other product used before. Product as showing in the photos. Happy with the price/quality. It's a good brush and caddy. We were looking for just a brush but were happy to find this combo for basically the same price. Very simple toilet bowl brush. The caddy should be a little bigger, so the brush would fit in it. Overall the product is good for the money paid. I purchased several of these brushes to replace old ones in the restrooms. They are working out great. They have strong bristles and are lightweight. This is a high quality toilet brush at a great price. We like to replace our toilet brush monthly and this is an excellent brush for the money. It is very effective and the handle is very comfortable to hold. Also, the length is just right. We purchased this to replace several brushes in our home. While it is nice and a beautiful white made of sturdy strong plastic, we wish the head fit completely in the caddy. The brush could also be a tid bit smaller to fit in the hole of the toilet. However, for the cost and quick shipping we were glad to pick this up. The only downside about this brush is the Caddy that comes with it. The brush doesn't fully fit (height wise) into the Caddy which is kind of odd but besides that it works great. Standard brush. We bough it for our staff restroom facilities. Very simple product, made fully of plastic, without any sophistication. Won't mind buying a new one if this gets damaged, but don't expect that to happen. Seems to be a reliable product.